Online marketing trends are changing continually as Google updates its algorithm, which can make it hard for small business owners to promote their websites effectively. This article explains how to promote a local business online. Google has updated its algorithm 34 times in 2018 alone. These updates change what businesses should and shouldn’t do to promote themselves online. The search algorithm updates have drawn attention to Local SEO, which has become increasingly important over the past few years. Business owners must consider Local SEO if they are serving a certain geographical area. For businesses with both single and multiple locations, local SEO helps grow and build an online reputation. In this article, I’ll outline how local SEO works and how to improve your own local SEO. If you rank for local searches, customers who live and work near your store know exactly where to find you. This isn’t just common sense – Google values location, too. Rank Ranger published a study on how Google shows local businesses in what’s called a Local 3-Pack listing. The following search is an example of a Local 3-Pack. 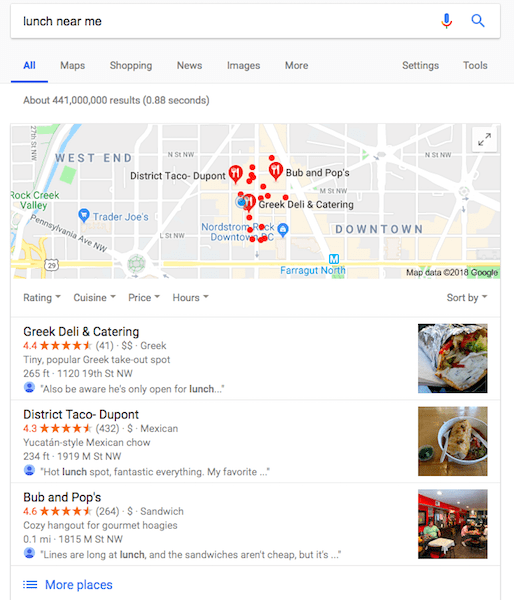 According to Rank Ranger, Google picks two businesses close to the searcher’s location, then one farther away, in a 2:1 ratio. Try the following tips to make sure that Google is properly pulling your company’s location. That way, you’re more likely to appear in the Local 3-Pack. When you geo-tag photos, you tell search engines the locations associated with each image. Post geo-tagged photos on Google My Business. You can use GeoSetter to do this. It is very easy to input information such as location, category, keywords, contact details, and website address. Also, create directional maps with your geo-tagged photos using Google My Maps. Here’s a step-by-step tutorial if you need it. ‘Schema’ refers to a set of tags that Google uses to file away information about your business. Use geo-coordinates in schema markups. You can use this Local Business Schema Generator tool for generating the schema markups code. You can also customize the code for aggregate rating, reviews, and pricing. Use terms such as “near me,” “near you,” or “nearby” in the meta title, headings, and meta descriptions for your website. This practice can improve your organic search rankings. It may also improve your mobile rankings because people often use terms like “near me” when they perform a search using mobile devices. Learn more about your impressions for “near me” searches by going to your Google Search Console dashboard. Look at the following path: Search Traffic> Search Analytics>Queries>Filter Queries>near me Then click “Filter.” You will get an idea about the search volume for your business. One of my experiences shows the importance of meta descriptions. After optimizing one of my client’s home page for “near me,” the client has experienced a 200% organic search traffic growth for “near me” searches. Get reviews from real clients to show off your business’s value. Then, show your reviews on your search results. 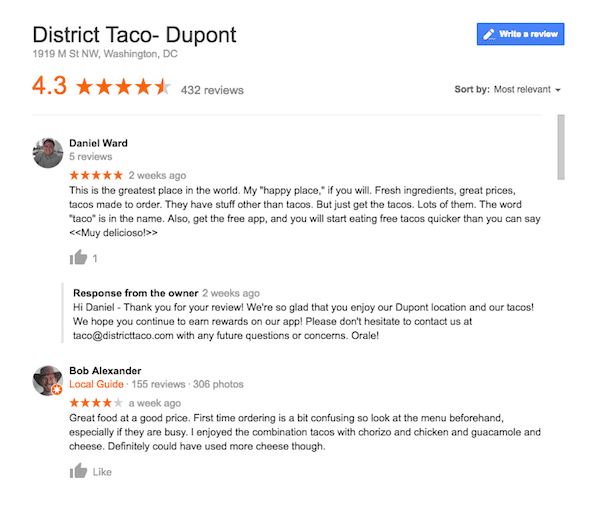 The better your reviews are, the more likely you are to get ranked in a Local 3-Pack. Here’s an example of a restaurant with many good reviews. The restaurant frequently shows up in “near me” searches. A business with positive reviews is more likely to appear in the Local 3-Pack. Ultimately, when you tell Google where your business is located and how good your services are, you get better results. Mobile searches are more popular than ever. Don’t miss out on local searches from mobile devices just because you haven’t optimized your site for mobile. The numbers show that having a mobile-friendly presence is worth it. Analyze your website and see whether it has all of those qualities. If it’s missing any, talk to your site designer to see if you can speed up your loading time or improve your navigation. Plus, optimizing your site for mobile search is a key part of optimizing for voice search, which is an increasingly important search vector. If you’re a local business owner, you can use local SEO to help customers find your stores. A well-maintained online presence that shows search engine users where to find your brick-and-mortar store will help you experience success. After all, you have to stay on top of best SEO practices in order to keep ahead of your competitors. This article originally published on Clutch.co on July 31, 2018. 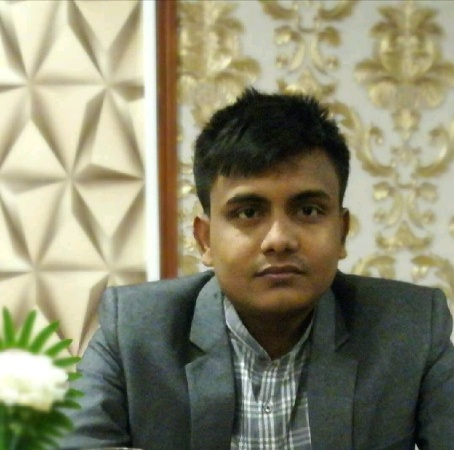 Jubayer Hossain is The Founder at SEO With Clarity, an SEO consultant and entrepreneur. He has proven himself as a successful online marketer since 2010 and founded Ninja Creative Marketing in 2017. He can be reached at jubayer@ninjacreativemarketing.com. Be the first person to know about the new post. Join now and Keep your online marketing Knowledge up to date.